Everything you need for a gourmet breakfast or brunch is here in the Eggs Benedict Box—just add the eggs. Our foolproof Hollandaise sauce, Wolferman's® super-thick signature English muffins, and tender, flavorful Canadian bacon are the key components to creating this elegant dish. 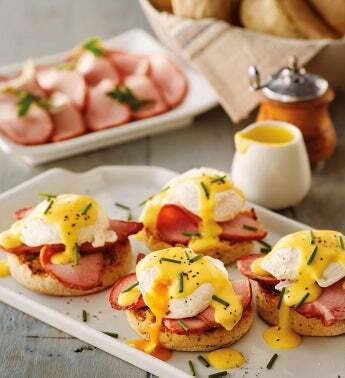 While the preparation may be simple, the final result is an eggs Benedict entrée that's perfectly seasoned, with an impressive presentation to match.